Packaging Details: 1. standard export packing 2. wooden packing 3. carton packing or as required 4. plastic packing. Product Description We are professional company manufacturer taper roller bearings.Our taper roller bearings widely used in automobiles, machine tools, agricultural machinery, textile machinery and many other fields. Packaging & Shipping 1. By Express: DHL, FEDEX, UPS, TNT, SF EXPRESS and EMS. 2. By Air: We can ship from Shandong, Guangzhou etc. 3. By Sea: We can offer you FOB Qingdao. 4. 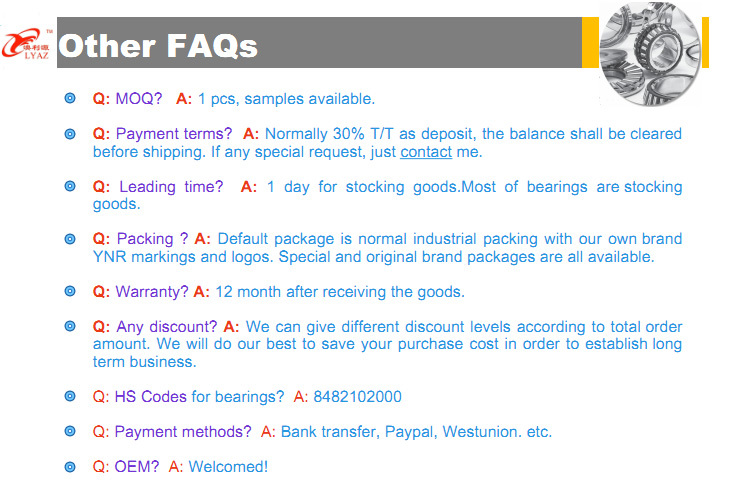 We can also send bearings to your forwarder or agent in China, who can arrange shipment for you. Our Services 1. 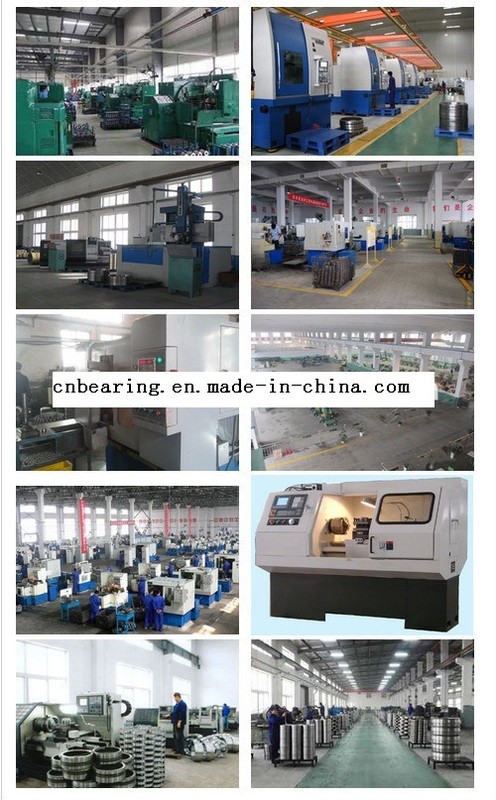 We are Professional bearing factory since 30 years ago.We offer high quality bearing with competitive price. 2. 24-hour response on line and provide technical support. 3. Huge stock goods ensure you Very Short Delivery Time(Generally 1- 3 days after payment for stocks, 15 - 30 days for OEM and new items. 4. Good after-sale service (12 months quality warranty, money can be deducted or refund if any quality problem). 5. OEM/Customized service are welcomed. 6. Various kinds of bearings and brands available. 7.100% test the quality and packing before delivery. 8. Free sample available. Company Information Our factory has been founded for around 30 years, We are a professional manufacturer of ball bearings and roller bearings, including Deep Groove Ball Bearing, self-aligning bearing, Cylindrical Roller Bearing, tapered roller bearings, with our good team work and hard working of skillful staffs and our professional engineers, we got very good reputation in the world market, especially in Mid-eastern countries. Thanks for every customer's support and trust, our company hope to establish mutual benefit and development business relations with you! 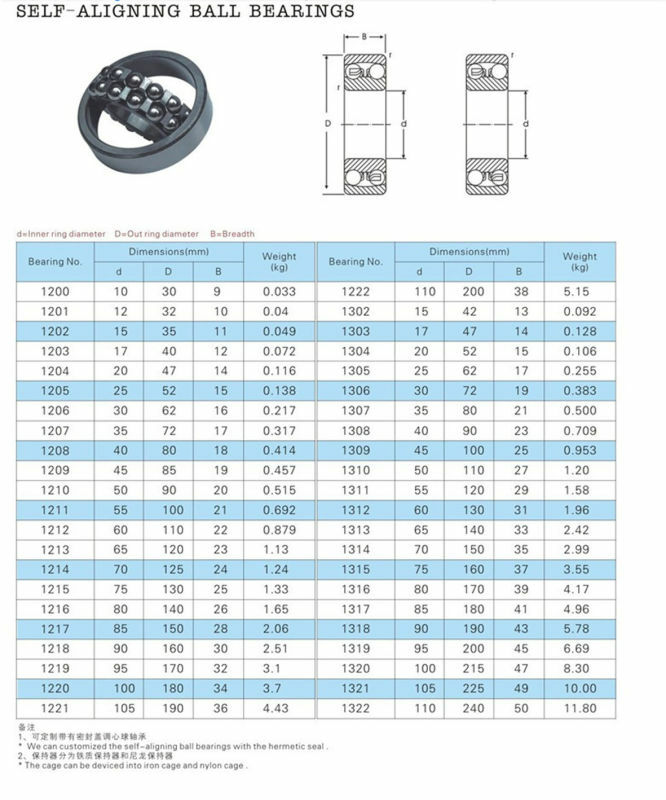 If you are interested in our products deep groove Ball Bearing, welcome to contact us for more detailed information, Your inquiry related to our product & price will be replied within 24hours Well-trained & experienced staff are to answer all your inquiries. OEM & ODM projects are highly welcomed. We have strong R&M team here to help. Free samples available The professional Logistic Center service Technical support after sale Any other reasonable requirements. 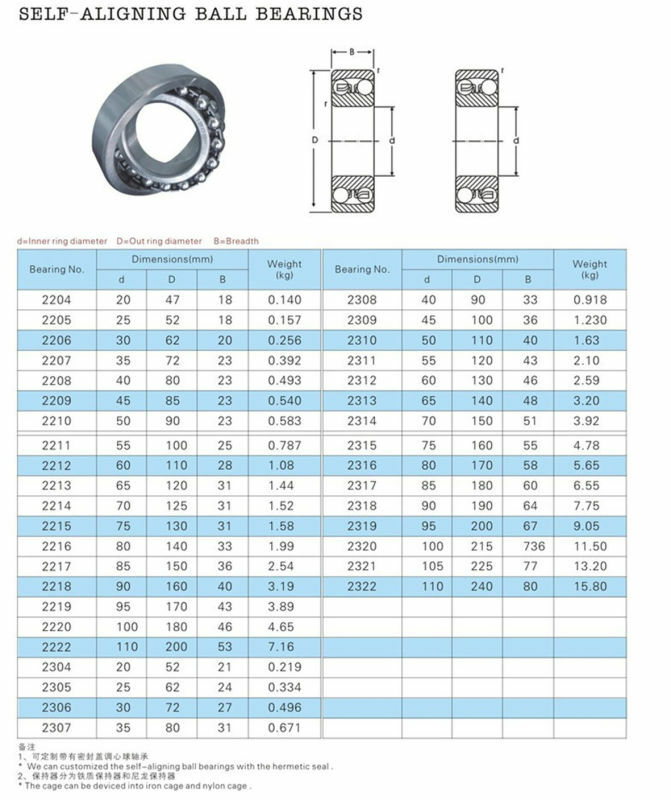 Contact us if you need more details on Self-Aligning Ball Bearing 2201. We are ready to answer your questions on packaging, logistics, certification or any other aspects about Self-Aligning Ball Bearing 2201k、Self-Aligning Ball Bearing. If these products fail to match your need, please contact us and we would like to provide relevant information.